It’s no secret that I love lentils. They’re so tasty, nutritious, versatile and — yes, I’m going to say it — cute; how could I resist them? Oh, I need to add economical too. These little legumes are culinary powerhouses. I have many recipes on the blog featuring or otherwise including lentils, and don’t see any reason to stop adding to them. 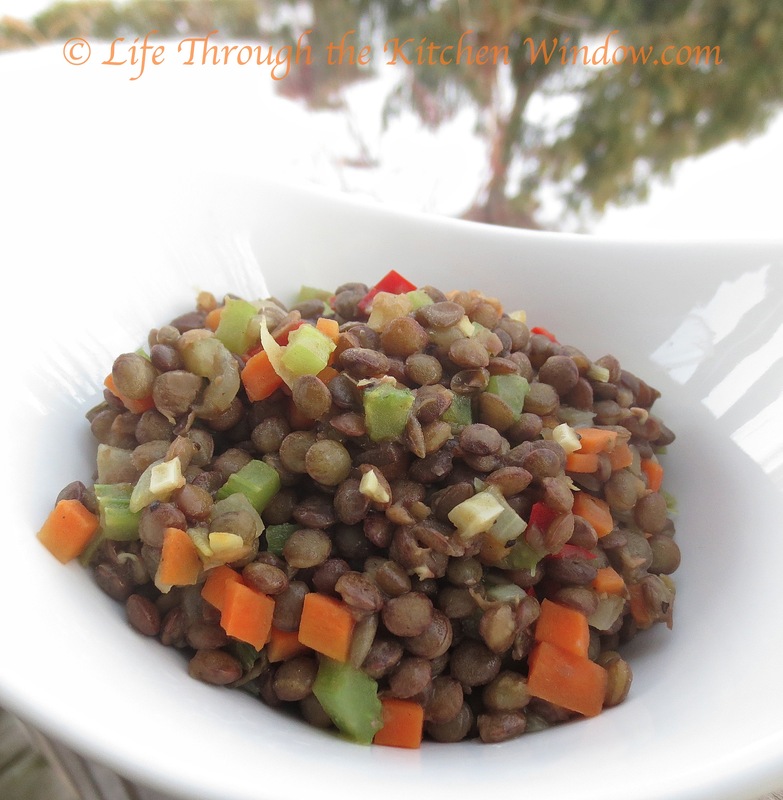 One of my favourite and easiest lentil dishes to make is one that I call Braised Lentils. I’ve been making it for years and have been meaning to write about it for ages, but it’s always been overshadowed by showier lentil recipes. Until now. With some cooked lentils in the fridge and a few vegetables in the crisper, you can put together this wholesome and tasty dish quite quickly. It’s basically finely diced vegetables, lentils, broth and a dash of vinegar for a sprightly touch. We enjoyed the lentils photographed for this post alongside baked Italian sausages for a simple supper. Mostly though, I’ve made braised lentils to take to work for a nutritious lunch. Any time I ate them at my desk someone was sure to stop by my doorway to ask what I was having. Apparently they inspire curiosity. I do like to take the time to finely mince the vegetables so their size doesn’t overwhelm the diminutive lentils. There’s no need to do that, but what can I say, it makes me happy. So does looking at the photo below of the brilliantly coloured veg; spring has been slow to arrive this year, but I’d say that plate of dazzling colour helps make up for it. I made this batch with French green lentils, which are slightly smaller than some other varieties, but it doesn’t really matter which you use as long as it’s not the red ones. You want the lentils to retain their unique shape and character, and red lentils quickly turn to mush. A quick tip: if you have leftover braised lentils, just add some extra oil and vinegar to make a loose dressing and spoon them over a green salad. So. Good. You can use any type of lentil for this recipe except the red ones, which will turn mushy. You want the completed dish to retain the shape and character of each of the ingredients, while melding them harmoniously together. This recipe is enough for a dinner side dish for two. As you prepare the vegetables, take a moment to notice how fresh and invigorating their scent is in your kitchen. That’s especially important at the dreary end of winter when it seems that the windows have been closed forever and spring is but an elusive hope. Stir in the balsamic vinegar, then taste and adjust the seasonings as required. 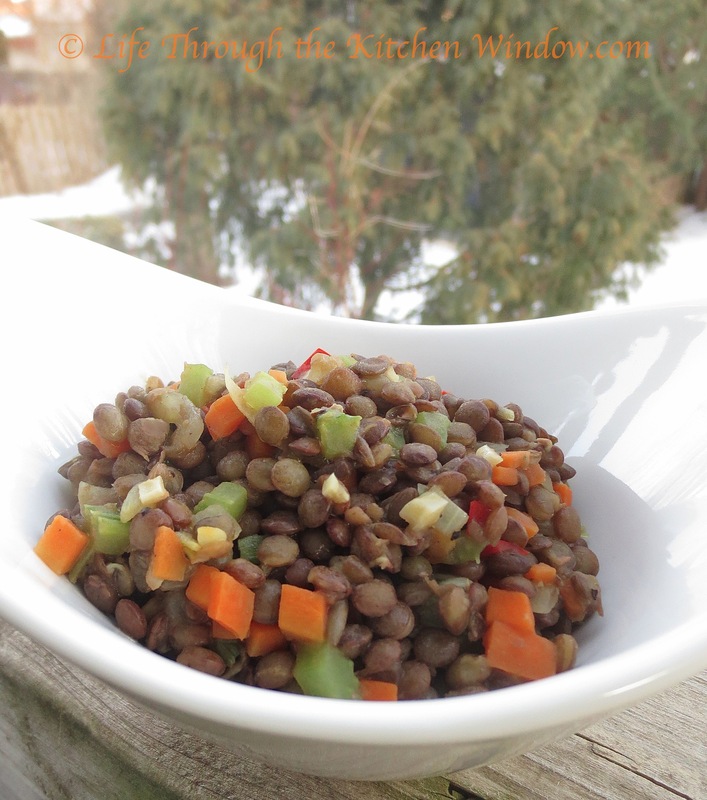 Marlene: Such a simple and delicious lentil recipe! I wish you has submitted some of your lentil recipes to the Lentil Challenge. You have such good recipes with lentils on your blog. I will definitely be bugging you next year to join in! With the amount of lentils grown in Canada and the lack of average consumption, I think we food bloggers have to push lentils more often. Thank you! I thought about submitting it but the registration form defeated me as my printer/scanner was out of commission, etc. I love lentils – they are such a delicious and economical way to get powerhouse nutrition! I’m planning to participate next year! I’m glad you like my recipes! I just sent you an email, BTW. Cheers! I love lentils, too, for all the reasons you mention! 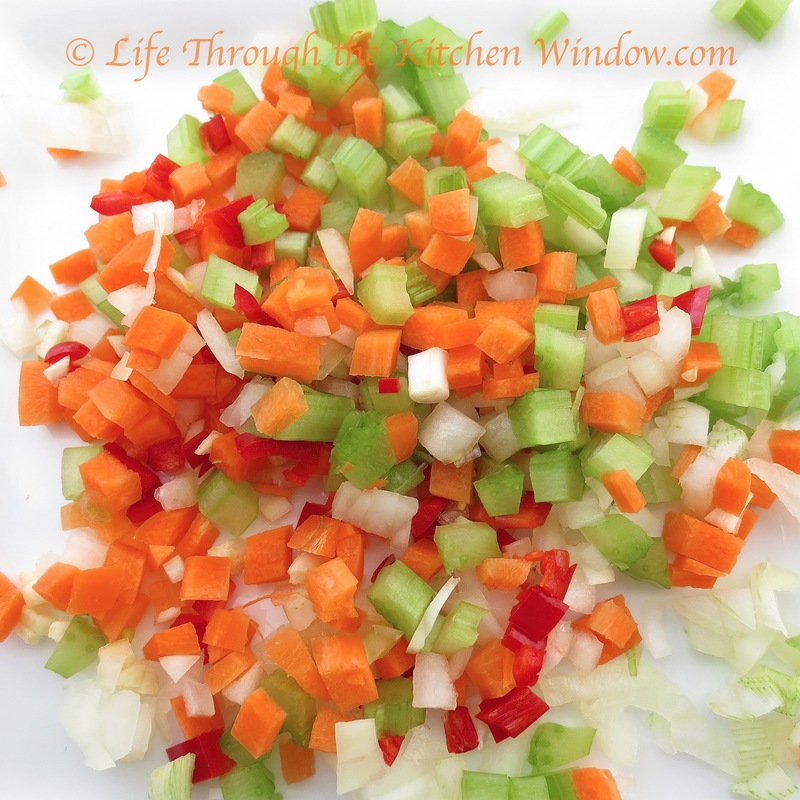 Your approach to chopping the veggies small so they don’t overwhelm the diminutive lentils is perfect and makes for a dazzling, colorful presentation! One of the other perks of chopping vegetables small like that is that it seems to impress other people (not that that’s a reason, right?). I was once asked how I got the vegetables to be like that, and all I could think to reply was, “With a knife.” I’m glad you enjoyed the colour; that’s one of the fun things about this dish. i love lentils, too. i feel sadness for people who don’t. or think they don’t!!! Yes, we should have a moment of silence for those people who eschew the humble lentil … they really don’t know what they’re missing! These are so good. My daughter saw me making them and said, “You’re making extra, right? !” And voila, a container of them was delivered to her door. And you’re right, those colourful vegetables are so welcome to all of us starved for colour during this long, long winter.